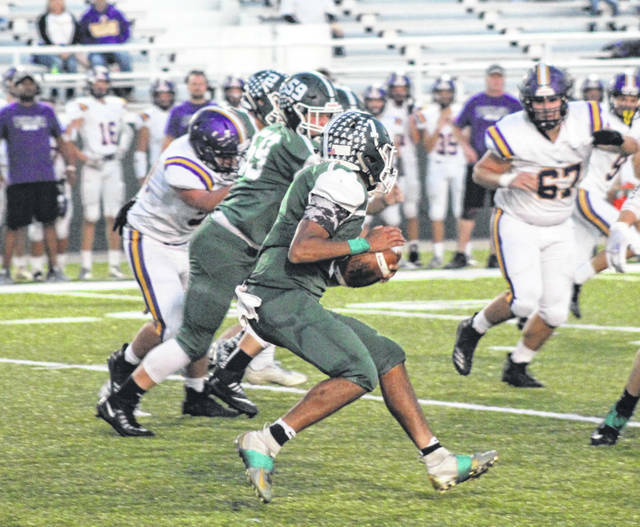 Greenville’s Marcus Wood (1) looks for an open lane to run through after he intercepted a pass from Butler quarterback Mason Motter during the first half of Friday night’s game at Harmon Field. Butler won the game, 37-21. 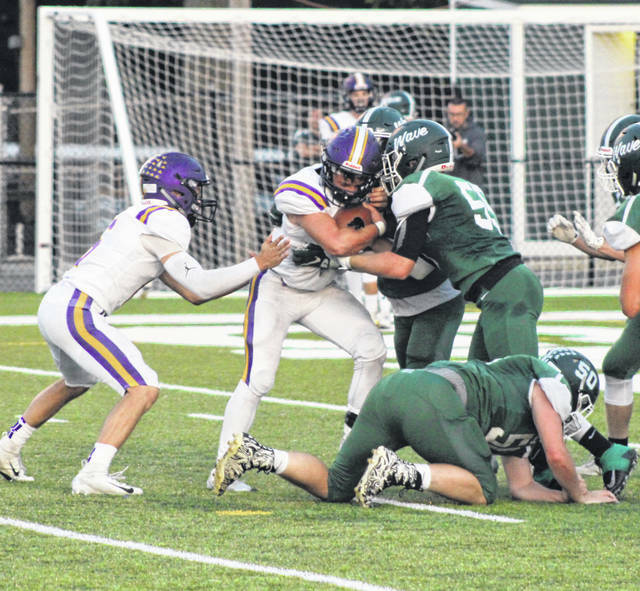 Greenville’s Alec Fletcher (9) and Colton Zumbrun (16) bring down Butler running back Ryan Martin during the first half of Friday night’s game at Harmon Field. Butler won the game, 37-21. 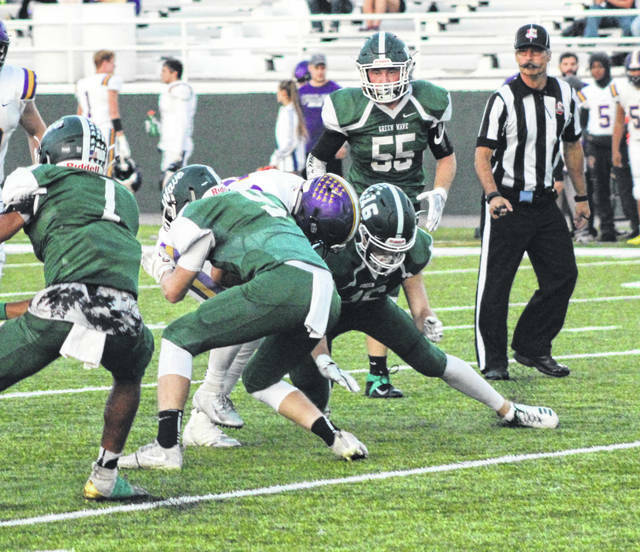 Greenville’s Terry Miller (55) and a host of other Green Wave defenders stand up Butler running back Ryan Martin near the goal line during the first half of Friday night’s game at Harmon Field. Butler won the game, 37-21. Greenville’s Tyler Beyke (18) runs out of the pocket looking for an open receiver during the first half of Friday night’s game at Harmon Field. Butler won the game, 37-21. 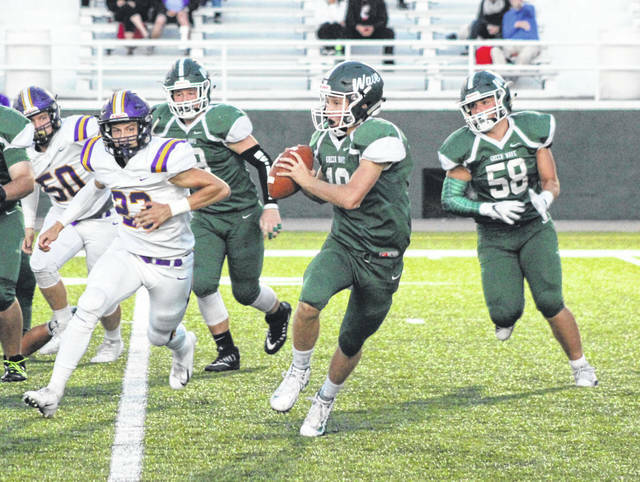 This entry was tagged Aaron Shaffer, Greenville Green Wave, GWOC, John Butsch, John Puckett, Marcus Wood, Ryan Martin, Tyler Beyke, Vandalia Butler Aviators. Bookmark the permalink.